Jim Lodico wrote an excellent in-depth article on quite a number of different aspects and advantages to using the embedded posts. Like embedded G+ comments, the ability to Embed G+ posts raises a new set of questions regarding context. Read on for a comparison of context issues. From a social sharing perspective, this could be very powerful. If I write something here that others enjoy enough want to publish on their own website, they now have the ability to do so. By using the embed code provided, as the author I will be properly credited and should receive any SEO or authority benefits that come with the sharing of the content. Embedded posts also provide an opportunity to expose G+ posts to those outside of G+ who may not have seen my original post on G+. For the most part, this seems like a good thing. However, like the ability to embed G+ comments, the ability to embed G+ posts does raise a few issues regarding context of which you should be aware. One of these ideas is absolutely great for CircleCount and without that Stephan Hovnanian was thinking about our website on this post (at least I think it wasn't his main focus ;) ) we have picked it up and implemented it. That means 14,001 different posts embedded on CircleCount.com with one change. Yesterday I was also considering the SEO implications of this new feature. At a first glance of a websites page with the G+ embedded post, we see all the same links in the original post, both follow and nofollow. 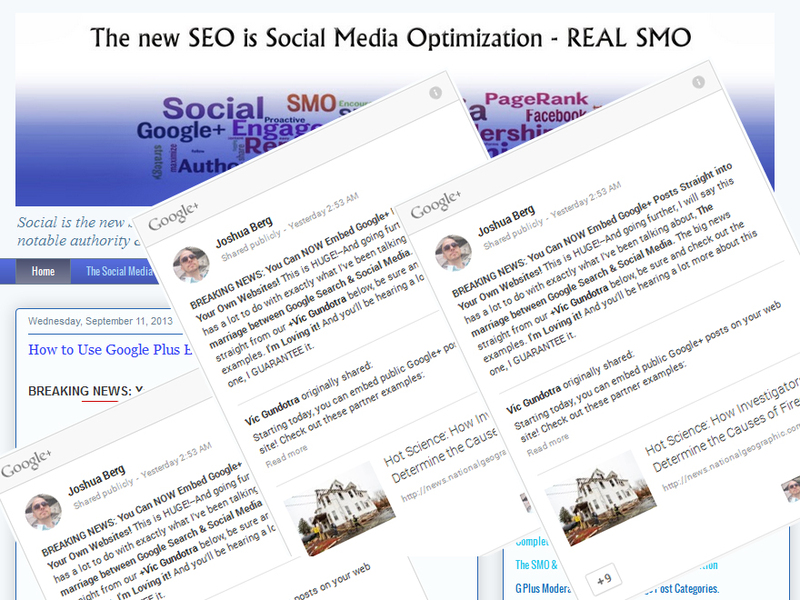 This might appear that the G+ embeds pass PageRank authority to all of the follow links within the post. However, a look at the embed code & on page source code, shows that the entire G+ post is Google script that appears in an iFrame. Here's the comment I made in regards to this yesterday. "It does NOT appear that these embeds provide authority follow links back to the embeds, after looking at it more specifically on the page's generated source code. It is a script actively generated in an iframe, the content itself does not reside in the page." "Using an on page follow link viewer tool, you will see the links as follow & nofollow, which can be a throw off. However viewing the source code, it is an active script in an iframe, something like the Google AdSense script generates active content on each page." Now there's still the question of whether the link in the widget to the original post, at least provides authority directly back to that specific post. I will say that it doesn't necessarily, because it is not a standard on page text link. There are however some differing opinions on this & what will really matter ultimately, is how the Google PR algorithm decides to treat these links & what kind of authority they wish to pass through to the G+ posts. If you think for one second Google+ post embeds do not have huge PageRank & ranking authority implications, just look at THIS article today. Wouldn't it be kind of silly if I referenced all these great Google+ Embeds, but I didn't talk about the authors? Notice every link on this page to each of the authors is a standard text FOLLOW link providing PR authority, context & relevance to each of the authors' Google Plus profiles. So now, what Google has provided with this new & much easier sharing technique, is for your G+ content to be shared much easier & faster across the web and with quality citations that would naturally accompany them. With all that authority being fed back into your G+ profile to spend at the Search bank as you will. Next we have MaAnna Stephenson who has assembled a beautiful article on how to do the embedding in some different kind of environments. At PlusYourBusiness martin shervington has some further clear & useful examples on embedding G+ posts into websites. In this example Lee Smallwood gives us some amazing new uses for application. The recent update from +Google+ re: #EmmbededPosts has really opened up a side to +NOD3x that we've been waiting for: The ability to engage on G+ posts without having to leave NOD3x. Why is this important? The visualisations of un-structured data we collect from G+ can now all be engaged with directly from: dashboards, relationship graphs, real-time streams. The ability to connect with people and engage on content that interests you is not only a crucial part of building authority it will increase visibility and extend the reach of content.